This is a special image I've been holding back on posting to save for celebrating my 50,000th view. That has now happened and so here it is, hope you enjoy it as much as I do! 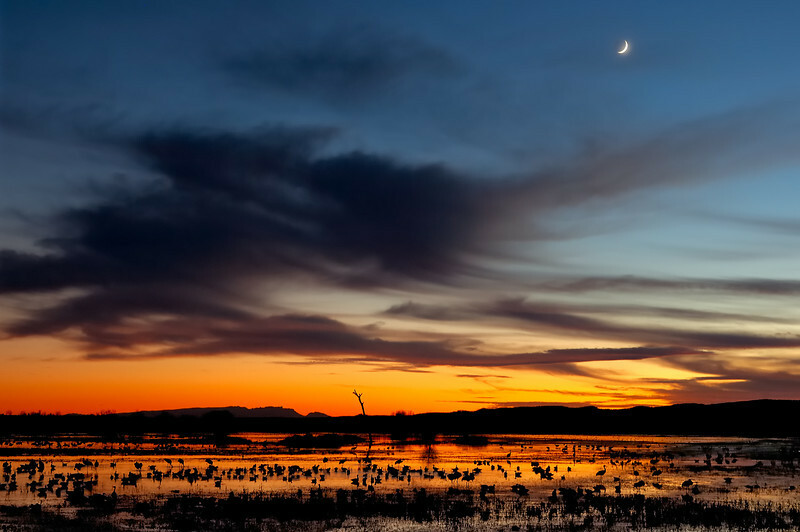 It's one of my favorites from our last trip to Bosque del Apache National Wildlife Refuge in New Mexico. 3/4 of the Rocky Mountain population of Sandhill Cranes winter in the area along with 10s of thousands of Snow Geese and gobs of other waterfowl (many seen as silhouettes in the sunset here). I highly recommend a visit around Thanksgiving during the peak, it provides one of the best wildlife experiences in the world in my humble opinion.